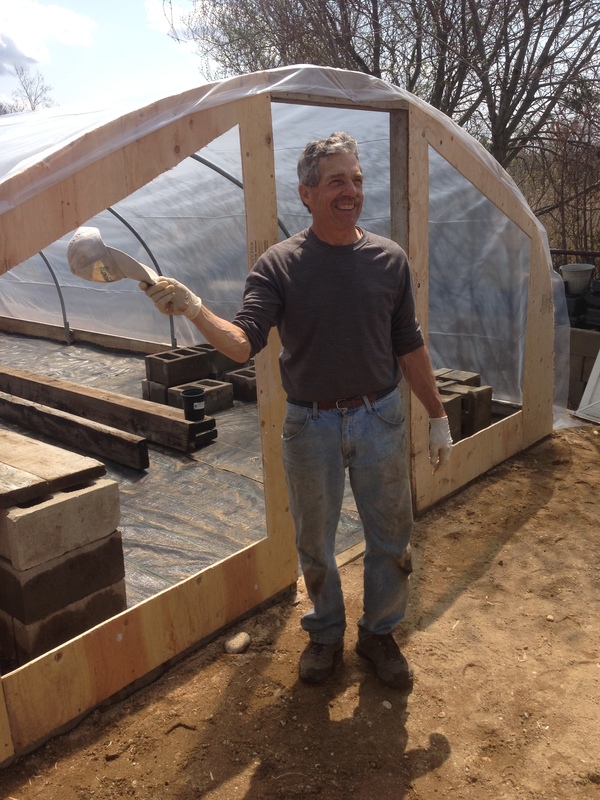 I am very very excited to have my guest join us today for a special Father’s Day episode of the Organic Gardener Podcast. Coming to us from the Long Island Sound, close to where I grew up, is a special father who’s daughter Alethea introduced us, after she was on my show in episode 32 back on April 9th, 2015. She told me the story of a natural educator who loved gardening and would take her around the neighborhood as a child and they would plant garden’s for friends and neighbors. I’ve been gardening since I was a kid, and it kind of developed in the last 15 years into a farm, a small farm maybe 8 acres, well it is 8 acres. I ended up doing a market with a friend of mine who started an organic market only. She had 2 farmers and one was just starting out, and I hadn’t even started out. She said I need some help, I need two farmers, the market will be a lot better. I had stuff growing, and it was early in May, and I started growing a few more things and it was just like a hobby, and before you know it I actually had another farmer who was conventionally growing who wanted to grow on my farm, that’s what I wanted to see happen. Unfortunately that didn’t work out for the long term, so I kind of took over, because I had certified for him, with him and I doing it together, he was my neighbor where we are on Eastern Long Island. We had 9/11, he lost his truck at the World Trade Center, he kind of cooled off in Organics. I think someone was giving him, he was doing markets also, and they weren’t into organics enough he was too ingrained in his way as a conventional farmer. Anyway, one thing led to another, I ended up 1 tractor, 2 tractors, 3 tractors, and all kinds of equipment, nothing fancy, increasing every year, what I’m growing, and the yield of course it’s certified organic, by OMRI. Basically that was my second job, I’m a contractor, I still do kitchens, baths, but farming takes up too much of my time. That’s kind of like a little background. I like that then, it must be profitible if you are able to not have to take as many contractor jobs and make a living off of farming, and also if you’re buying tractors it sounds like you’re turning a fair profit. Well, it’s not earth shaking, but it’s not the year, they’re nothing to sell, well they’re stuff to sell if you store it, but usually after Christmas there’s some down time, usually you before you start seeding for the next season. But also I’ve been buying some seedlings, so I don’t have to heat my greenhouse, because it’s cost effective way, buy seedlings from certified organic growers of course. It’s $3-4 a pound on long Island here and probably $4-5 for an heirloom tomato. I do 3 crops of tomatoes and I only buy the first crop. Other farms, that also have greenhouses, that sell retail and wholesale there are several good sources. Conneticut, upstate NY, some I’ve been buying from for years. Mac Enroe organic farm produce really beautiful plants, they have a composting facility, they use their own compost, and they sell the compost. My farm is not really a true business, it is and it isn’t. I probably could have grown more, I don’t do CSA’s they seem to be more profitable. They have a more steady secure income, they’ll sell 500-1000 shares in their farm, and they get the money up front so the risk is taken out of it, And they just have to provide vegetables for 24 weeks out of the year. Once you get the weeding done, then you still have to pick it and sell it! If you don’t you’ll end up with stuff in the compost pile, which happens anyhow, you always have to grow more then you need. If you compost it. I’m a native NY’s long island NYC, born in NYC always lived on Long Island, I like more open space and trees, NY has a lot of parks and stuff, I always tended to be out in the woods or the fields somewhere, or fishing or something like that. The family always had like a small garden, and everyone pitched in, I kind of took over, one of my cousins helped, but then there came a point in time that we had a little problem with something eating the tomatoes, then you read about it, so you can make stuff go away and not eat your fruits and vegetables and most people would show you put all the chemicals. I remember distinctly my father said, “you can grow a lawn now and you can put a chemical down and it only kills certain things and your lawn grows!” And he was talking about 2-4d which is part of agent orange and other’s like that. I read about it and it really struck me as counter productive, to put all these poisons on what you’re gonna eat, and that it might persist, so we always had this garden, I didn’t want anyone to use chemicals. I guess it was my idea, I was reading labels, and then researching it, and this doesn’t sound like a really good idea. It’s like thumbing your nose to spite your face almost! Here we’re gonna eat this, but first let’s put some poison on it. Organics you have to be careful with that stuff too, the theory with organics is they don’t persist in the environment, a lot of biologicals, if you don’t have that many potatoes, you can kill the Colorado potato bug with you fingers and just monitoring the field. We have about ½ an acre of potatoes, we’ve been just been mechanically beating the bugs off the potato plants. Having a bucket, and taking a rolled up newspaper and gently brushing the beetles into a bucket, the just come right off and fall into the bucket. We get rid of these bugs we have that look almost like a soap and little beetles or something just by spraying them with water. You can do that with aphids too, or with soap. There’s this stuff called Entrust which is a spinosad bacteria, it kills a lot of worms, and kills the potato beetles in the larval stage. The conventional farmers use that too. They use the same thing for potato beetles in a lot of cases. There’s a lot of overlap, that’s what I would like to see some day, to actually, to see organic farming like disappear! It should all be organic farming and we wouldn’t have to have a distinction between organic and non-organic. It should all be organic. Organic farming is having some influence on conventional farming, There are a lot of things that organic farmers that conventional farmers use, and I think there is enough product out there and research going on eventually we’ll have organic farming blend in, and influence regular conventional farming. So when I say I want it to disappear, I want it all to be organic! That’s what happens the more and more information on the chemicals being used for weed killers, their true colors are beginning to show up. Of course, they use agent orange now. 50% of agent orange is always been used: 2,4D is one of the active ingredients in agent orange. There are 2 chemicals – one was banned in 1973, another one is prevalent. Every-time someone goes out and buys a formulation of weed and feed or Scott’s plus 2, usually the weed & feed in the northeast is 2,4D. People are just buying it, and don’t really know it what they are doing, so education is very important. Doing it on a 1-1 basis is almost impossible, and they don’t want to listen. Listen for our discussion about glyphosate and other chemical pesticides readily available. Well, it means not using stuff that is gonna end up in your blood stream that could harm you hopefully. Back when my grandfahter grew up basically everything was organic, before 1950 they probably used sulfur, but other pesticides were’t developed yet. Then they were developed. You solved one problem, but you created another problem. They killed the weeds, but then they developed another problem, like the weed killer might be hurting our health. Solve one problem, make another problem. Even big companies are researching other ways to do things. I kinda learned on my own, just asking questions, reading about it, seeing what other farmers were doing. Then when you wanted to certify, you found out there’s a lot of other things I didn’t know about that I should be doing. You just follow the rules, and read about things. It’s really not a hard decision. I don’t know if we can feed the world organically? But I think you could, eventually, unfortunately chemicals made the world more populated because they increased yield. A lot of people, that were fed by conventional farming. It fed a lot of people, then all of a sudden there was a population explosion. All over the world, where a few people were producing enough food for a lot of people. Little farms disappeared, less farms producing more food, but meanwhile the population went unchecked. Kind of a theory, with over population it became harder to feed as many people. Maybe we could manage population worldwide. The food supply is very precarious. To learn more about the Rodale Farm Test Trial you can read about it here on their website at the Rodale Institute. Onions, there’s onion root maggot, didn’t seem to be around as much. This year we had a lot of cold weather at the beginning of the season when we planted them, my seedlings didn’t come in as good shape, so this year my onions are not as good. Every year is different. Some crops are always good, like zucchini, the peas are usually good, the tomatoes, the winter squash was really good last year. I direct seed mine with a little seeder, the same with beets and carrots, it’s hard to sacrifice some of your plants, but you just have to pull them out, otherwise the other ones don’t grow. Even with a seeder you have a hard time with seeding carrots. Carrots are even better then beets. Beets if you don’t thin them out, one year I did that, and I ended up not getting any beets, I ended up with lots of leaf, but not many beets. Beets are easier for me because I eat the beet greens. You can make a soup out of carrot greens. I’m gonna put up a little hoop house, and grow cucumbers in it, because cucumbers are suseptible to mildew when the weather gets colder, if I put them in a little hoop house and close the doors, it will stay a little warmer. I don’t even spray them for mildew. Some people cover them with a row cover, you’re always trying different things. I’ve been mulching my potatoes with straw, it seems to keep the weeds down, that seems to be working well the last couple of years, you have to make sure you put enough straw on that the sunlight doesn’t hit. Also, don’t eat green potatoes. Sunlight makes the potatoes create a poison, look up poison potatoes. Basically that’s why potatoes are buried, so sunlight doesn’t hit them. 2 years ago we had a problem with a Hawaiian webworm on the beets and the swiss chard. Little moths everywhere. We got beets, but the tops weren’t good. Every year it’s a little a different, sometimes the tomatoes are better, I find when it’s hotter, you get better tomatoes. For tomatoes you have to have enough calcium, or you get blossom end rot. Things you learn, if you have a problem, you look it up in the book or ask somebody. So all the farmer’s share the information, even conventional farmers are good farmers, just they were brought up on chemicals, so they are hard to change, and that applies to anybody. So what can you do to add calcium to your tomatoes so they don’t get blossom end-rot? Add lime, calcium carbonate. You can check your ph, if your ph is a little higher you have enough calcium. You can’t check every spot you’re gonna put a tomato in, so you have to make a judgement and maybe do the whole row and see what happens. You’ll know in a few months or something, and you could overdo it, you can go the other way, and have another problem, so you just have to do soil samples, and see what you get. I added lime to the soil for several years in a row, and then I found that my ph was more acceptable, we had a low ph here, maybe a 5.2/5.4 then we ended up with like 6.3/6.4 which is more acceptable. But for potatoes, 5.2 is good for potatoes, it keeps them from getting scab or something. That’s why they grow well on Long Island because the ph is slightly lower, so for potatoes it’s good, but for tomatoes it’s not. GMO’s another thing that you have to watch for, it’s not proven that they are bad, but it’s not proven that they are good. Shouldn’t use something that you think is gonna be good. We don’t know that it doesn’t cause something. I can’t prove that somethings’ bad for you, you can’t prove that it’s not. If you continue to use it till you have more proof? Why use it if you don’t need it? They say they need it, it tends to end up using more pesticides, end up using more weed killer because the weeds become more resistent. Now they are switching from Roundup ready to 2-4d ready, once it affects someone’s health. If you follow my whole point if it’s not proven to be good, why bother using it, till you have more proof? I’m sceptical, you’re telling me that it’s safe to use, but neither one of us has definitive proof. We shouldn’t be using it. In other words companies have us using these things and we end up being the guinea pigs. Dr. Stephanie Seneff discusses Roundup’s Glyphosate in Episode 9 of the Organic Gardener Podcast. Click here to see the graph of autism_6_years_old. You can grow anything you want as long as you figure out what it needs. Onions they grow well here, but they grow better in warmer climates, I grow okra too, it’s pretty easy to grow, bugs don’t bother it. I eat it raw! You can eat it raw, it’s not slimy when it’s raw. Even the big ones can be tender, as long as they’re growing fast. In the good weather, a big Okra can even be tender. Melons are a little more challenging, watermelons seem to grow well where I am on Long Island, even though it’s cool up here, we seem to do well with the watermelons. Melons die off with mildew, I don’t really take care of them, as far as spraying them for mildew, something on the organic list. I like to do everything, but not too much of one thing, for example, having a big field of carrots or onions, it’s a daunting task if the weeds get out of hand, so you just have to keep ahead of them. Mulch them. First you weed them, then you mulch them, sometimes you can just plant through the mulch. I like it all, it get’s tiring to do everything all the time. Sometimes some things are better then others, watching stuff grow, that’s my favorite activity. My telephone. So I can call up people to do the weeding for me. A hoe. One of my tractors, with the attachment, my rototiller. I have a Ford, Diesel 4000 and I have a Kabota, little tiny Kabota, that’s the one I would take, it’s very versatile. And I have a 1958 Ford, which I don’t use much anymore, I have some lawn mowers, all the attachments to the tractors fertilizers, seeders, etc. I like them all, but if I had to take one, I’d just take the little guy. I don’t do much of that, Sometimes, I dehydrate, some things, I leave that to my son -in-law or my wife, she does the tomatoes, she makes sauce and freezes it. Dependent on electricity, if your freezer doesn’t go out. I keep onions all year, I’m still eating onions that I grew last year. I just keep them in the garage is cold enough or the basement. I’m still eating sweet potatoes, from last year. Order some sweet potatoes from a grower, you plant what looks like a little stem of a plant, I don’t know if it’s too cold out there. They grow if you let ’em. The way we do it, they call em, slips, basically just a stem of a plant, it starts to develop leaves on it. Probably have too much lettuce, start picking it before you think your gonna need it, all of a sudden you just have too much. With lettuce you just have to keep planting, every two weeks, as often as you think your gonna need it. It depends on how fast it grows and then matures and then it starts to rot. So you grow other lettuce while your eating, and it grows in succession. Tips for eating it, IDK, chew. Not really bizarre once you eat it and like it. Some people might think it’s bizarre, but they just don’t know. Purslane, grows wild on my farm, I sell it and I eat it, I eat it raw, I make juice with it, it has a little lemony taste, it’s even a crop I do grow indirectly. I don’t sow it, I allow it to grow as a weed, but it’s not really a weed, it’s a crop. 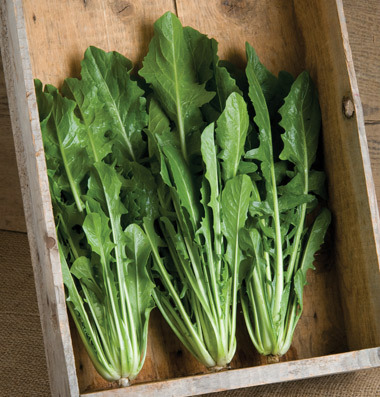 And I grow dandelion greens, ones the real kind with the yellow flower and one’s actually a chickory, Catalogna, italian dandelion, High Mowing Organic Seeds, or Johnny’s. When it becomes a puff ball, it starts to send up leaves again, I’ve cut the same dandelions now for a month, as long as you don’t pull the root out. It’s free seed! I always tell people when I explain to them, that chemicals are bad for you, they’re actually worse for a homeowner to use, because they tend to get more on them, so I think dandelions will end up killing a lot of people or make them sick, what’s been created by adverstising is this myth that dandelions are the enemy, that we have to get rid of them, and what is get rid of them is the chemical 2,4D. You’re getting rid of a food source, and it’s a pretty flower, don’t pose a threat to anybody in anyway, meanwhile people are poisoning themselves trying to get rid of the very thing to make themselves healthier. The yellow flowers ones are even more nutritious then the Italian one, which is really just a chicory, just another variety of plant, it’s just a leafy green. That’s why weeds are dangerous because people think they have to get rid of it. Listen for more of the discussion about green lawns. Getting back to dogs, my cousin read a book, Pukka’s Promise, why dogs in the US, die young, same breed will die young in the US, one of the things is what they eat, and the breeding, and the toys they play with and a whole chapter is dedicated to the lawn chemicals that the dogs ingest. Very informative. He’ll mention all these lawn chemicals people are using might be why dogs in the US die younger. He’ll mention that 2,4-D also. I found this article on pets and lawns after researching Pukka’s Promise’s author Ted Kerasote who recommended this website for pet health articles. Just raw, or I like tomato sauce, my wife makes tomato sauce, nothing added to it. (Peter’s wife interrupts in the background here and adds onions and garlic…) Onions, garlic, I grow a lot of garlic. I like to plant the garlic from a bulb. Garlic is planted from a bulb usually. I plant the garlic bulbs in November and they winter over, they start coming up when they are ready, whenever the weather permits, ready to pick around the first week in July around here. We also take the garlic scapes which are the seed pods, they taste just like garlic, we cut them off, that makes the bulb grow bigger. It’s like a gelding on the horse, if they cut part of the gelding off so the horse will get big. The same with the garlic, otherwise your head will be smaller. So we eat the scapes, the garlic gets picked, then we dry it. Some onions come in bulbs, called sets, sometimes I grow some, I grow more in sets, because they are more dependable. Sometimes they grow in flats, they don’t have to be picked and stored and picked. They don’t hold the soil very well and tend to go into shock and not grow as well. They grow in sets are more dependable. Every year is different. People who send me the onion plants not always as good as the year before, sometimes they’re better and sometimes they’re worse. They use from seeds, I direct seed onions in August, a walla walla variety, that winters over then in the spring I’ll I’ve had onions that are 2 1/2 lbs, they’re really sweet, but they spoil fast, but they’re delicious. I grow them in NY, same problems with the weed problems, if you don’t take care of it, you get a lot of weeds, and this year I didn’t take care of it, those winter over and those are hardy once they get growing, they don’t need transplanted, you can transplant the ones you thin out if you want. Publications or a book about plant diseases, with pictures. Look online, read the seed catalog, get all kinds of bulletins from seed companies, they explain a lot of diseases, mostly just trying to sell their products but you can learn what works for certain things, I talk to a lot of people. I get a lot of information that way. I tend to fall asleep at the wheel when reading :~) I like to talk to people, and see what their experiences are. We have flea beetles, they attack Kale and Brassicas’ a lot and some other things. Someone asked me why don’t you try this crab and lobster shell mix, so I bought a bag, a 50lb bag it seemed to really help, but then I talked to other people and they didn’t have the success I did? But others did? Maybe they weren’t using it the same way, but it seemed to work for me. Where do you selling your produce? I have 2-3 other grocery stores I sell to. I have about 4-5 restaurants that I deal with, they will actually alter their menu, I’ll call them and I say I have all this butternut squash, they’ll say ok bring me a case. Some people call us up I tell them come on over and we’ll sell it to you. The only consistency is, you know, every farmer can’t produce everything all the time,you know and have a, so some guy might be in-between crops of zucchini, so what the store’s not gonna buy from him forever just because he doesn’t have it that one time, No, they know that. Sometimes I give it to soup kitchens. I give it away sometimes to people if they need it. And I feed my whole family, my aunt, sisters, cousins . . . Happy to see it get used. I feed the microbes, I feed them everyday. I gotta tell you we’re all composters, we’re all walking compost machines. Horse manure is a problem, weed killers getting through not being throughally composted. which I think we’re capable of doing.